Pizza rocks! 😀 At least I certainly think so. It has a lot going for it. 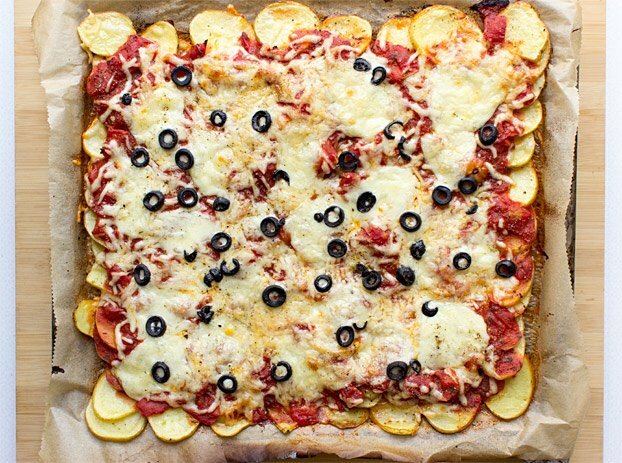 But for some, pizza potatoes are the answer. To most, ‘gluten-free’ is just a myth – a phrase made up by marketing supremos who target vulnerable eaters into paying more for a swishy new slogan on the side of their food. 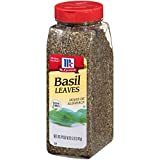 To those few that suffer from adverse gluten reactions or Celiac disease, it’s a horrible experience. Therefore, in the aim of making pizza for everyone, we have an alternative. 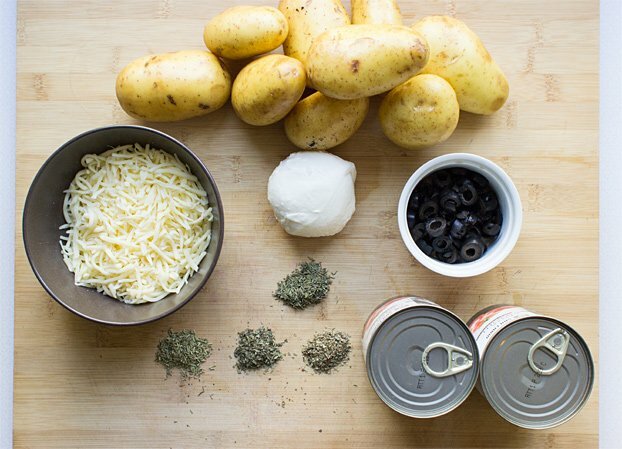 Pizza potatoes. By using potatoes as the base, we can eliminate gluten. We can also make a damn tasty meal. In fact it’s so good that I’m finding it hard to go back to regular pizza. You’ll see what I mean after the first bite. Make them however you like – transfer all your favourite pizza toppings over to this bad boy instead. It’s easy to make big batches – perfect for families, groups or parties. Tastes great the next day – not that there will be many leftovers. 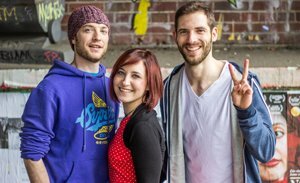 If there are you can take them to work and reheat in a microwave – or even eat cold! Yep, seriously. They’re gluten free. If you’re in the minority that needs to avoid the big G, then these pizza potatoes have got your back. Did I mention how good they taste? Your pizza, your choice. To save time – leave the skin on the potatoes! Not only does the skin have lots of nutrients and some extra fiber and protein in it, it tastes great too. Just make sure you give the skin a quick scrub first, and if any areas don’t look nice then skim them off. There you go. 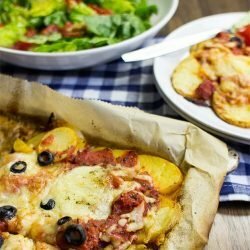 Amazing tasting, gluten-free, pizza potatoes. The proof is in the eating as they say – so what are you waiting for? Hands down, the best gluten-free pizza alternative out there. Never feel like you’re missing out again! 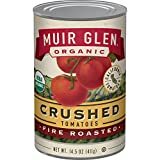 Pour the crushed tomatoes into a bowl and add in all the herbs, salt and pepper. Give it a good mix with a fork. Pre-heat the oven to 180°C / 360°F. 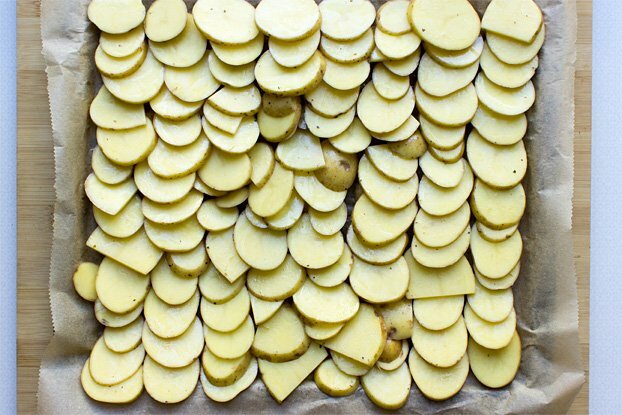 Cut the potatoes in small slices (0.2 inches/ 0.5cm). It’s your choice if you want to peel them. I don’t. 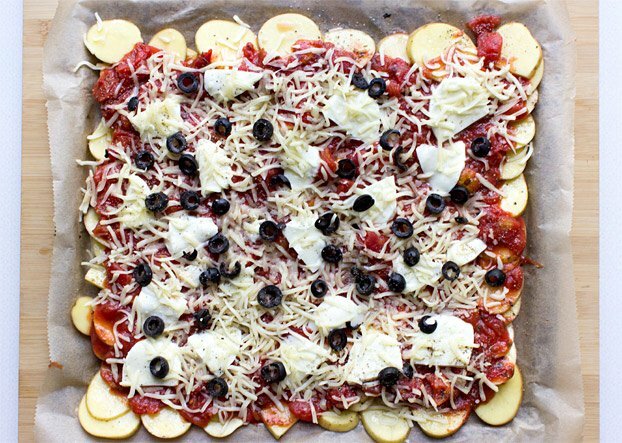 Next, in a bowl, toss the potato slices with olive oil, then layer them on a baking sheet. Sprinkle a little salt over the potatoes. Now spread the tomato mix evenly on top of the potatoes. Slice the mozzarella and grate the cheddar. Sprinkle on top of the tomato sauce together with the olives and whatever other toppings you’re having. Now off it goes into the oven for 30 - 35 minutes. 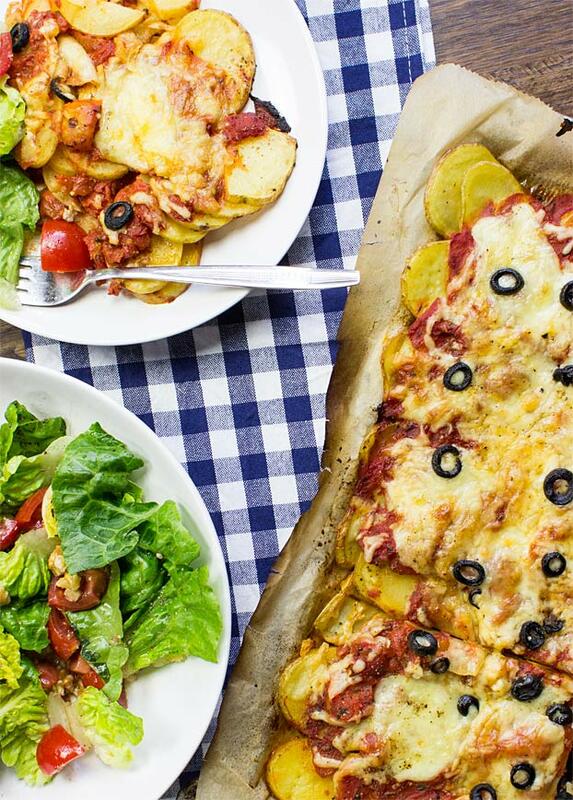 These pizza potatoes are awesome with a simple leafy salad. Your favourite pizza toppings are optional! Think capers, pineapple, jalapeños, peppers, sweetcorn, spinach, red onions, mushrooms, sliced zucchini - whatever floats your boat! 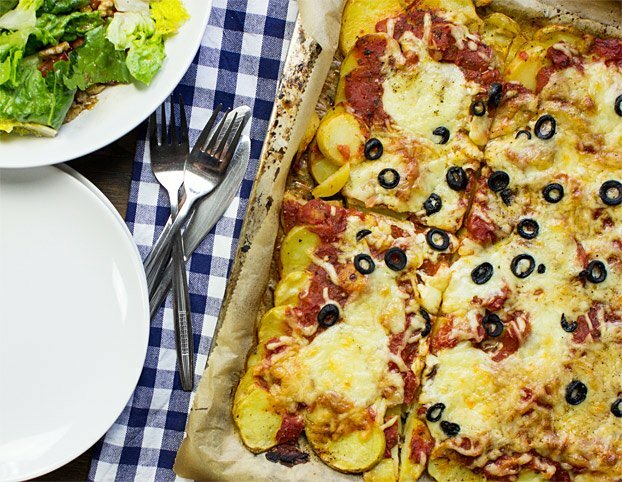 If you liked these pizza potatoes then you definitely need to check out our Farmer's Breakfast. It’s a similarly tasty potato dish. Or how about sweet potatoes for a change? Then we can highly recommend these Baked Sweet Potatoes with a Greek Salad. Delicious! AND FINALLY! Some people have reported that the potatoes aren't always cooked after forty minutes. If this happens to you, then try adding about ten minutes to the cook time, and going up to 200°C/390°F. Also, if possible, grab some potatoes that cook to more soft inside (starchy potatoes). I made this today and loved it. 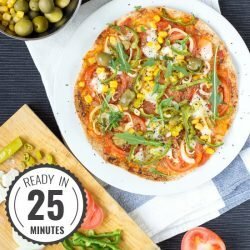 I’m really curious to try this pizza with pepperoni and red pepper topping, thanks for the recipe! could you make it on eggplant to make it paleo? Yes, I’m sure eggplant would work as the base, Jane! 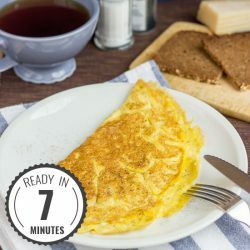 Tried this one with some Feta cheese on it and it was just great ! Thanks guys ! Made it! I will try with parchment paper next time to absorb a little of the oil which I drizzled over top. My potatoes were a bit too thick so I added 15 min cook time. I tried: marinara sauce, mozzarella ball, spinach, prosciutto, and olive oil. Yummmmmmmmm. Topping was nice-ish but potato’s (used half white/half kumara) were undercooked; or should I say not cooked. They weren’t cut too thick, I was very particular about that. Left them in for an extra 20min and still undercooked. Ended up eating the topping of what was ‘served’ and threw the potato’s out. The half that wasn’t served are clocking up about an hour of cook time and still feel hard. Hi Lu, uff, tough one! First – sorry to hear they didn’t come out like expected! I am quite surprised – especially with an extra 20 mins on top. That means that thinly sliced potato was cooked for 45 mins, but still wasn’t cooked! It shouldn’t be like that, of course. 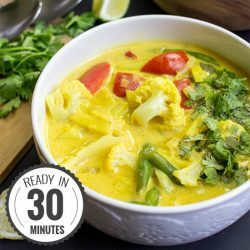 I plan to make the dish again soon anyway so will double check on all the instructions – I’ve made it many times successfully in the past! The other thing that comes to mind is that the oven wasn’t hot enough, or circulating heat well enough, or perhaps even the type of baking tray had an affect. I’ll definitely look into it. In the meantime, don’t give up on home cooking – it can and will rock for you, I’m sure!! I made this. A large pan with pepperoni and sauce, then a smaller pan with carmelized onions and mushrooms. It took longer for mine to cook, I actually cut the potatoes thinner, so I dont know why. My family loved it.